Zersenay Tadese was denied an unprecedented sixth IAAF World Half Marathon Championships title, and indeed an individual medal of any colour, on Saturday as Geoffrey Kipsang Kamworor completed a Kenyan double in Copenhagen. 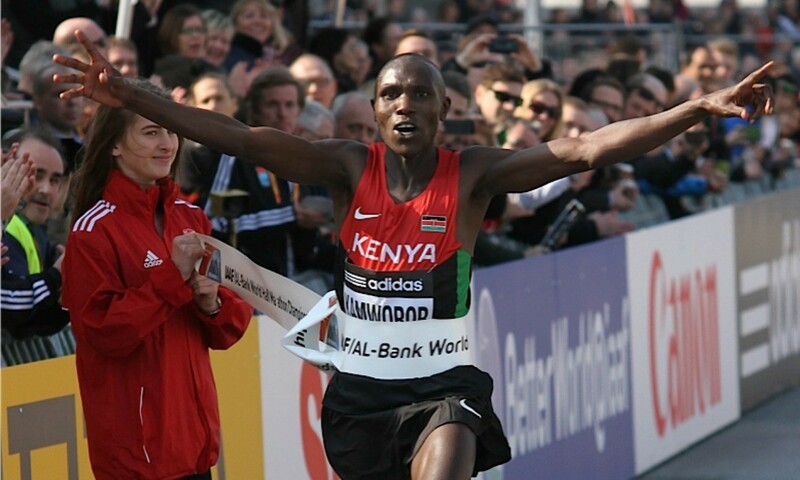 With a world-leading 59:08 – the second-fastest winning time ever at these championships – 2011 world cross junior winner Kamworor cruised to a 13 second victory ahead of Tadese’s Eritrean team-mate Samuel Tsegay and Ethiopia’s Guye Adola. Tadese, who has built up an incredible record over 13.1 miles, clocked 59:37, which, despite being quicker than the times he posted when winning his 2008 and 2012 titles, was only enough for fourth. He won’t leave Copenhagen completely empty-handed though, as Eritrea claimed the team title for the 32-year-old’s 13th medal at this event. It was the first time the nation had taken team gold in the men’s event, with Kenya securing team silver and Ethiopia team bronze. Wilson Kiprop, who won the world half title in 2010, had been billed as the athlete who would likely pose Tadese’s biggest challenger. But it was another Kenyan who eventually claimed victory on the day, with Kiprop clocking 60:01 for sixth, one second behind Nguse Amlosom. It was personal bests galore in the men’s race, as 14 of the top 20 athletes set lifetime bests. GB’s sole athlete in the men’s race, Ben Moreau, was just outside his PB with 64:09 for 64th. Kenyan athletes dominated the woman’s race, not only claiming the first-ever clean sweep of the medals at these championships but filling the top five spots for the first time a nation has achieved the feat in either the women’s or men’s race in World Half Marathon Champs history. Leading them home was Gladys Cherono with 67:29. The world 10,000m silver medallist won a three way battle for victory, eventually finishing 15 seconds clear of Mary Ngugi. Like Ngugi, Selly Kaptich ran a personal best, clocking 67:52 for bronze ahead of Lucy Kabuu and Mercy Kibarus. Kaptich and 2006 Commonwealth 10,000m champion Kabuu had led at 10km , going through in 32:14, while 15km was reached by the lead group in 48:08 before Kabuu was dropped, leaving Cherono, Ngugi and Kaptich to battle it out. Cherono was the stronger, eventually breaking away for her clear win. Behind the Kenyan top five was Ethiopia’s Netsanet Gudeta, followed by France’s 2010 Paris Marathon runner-up Christelle Daunay and Italy’s world marathon silver medallist Valeria Straneo. Behind Kenya’s team win, Ethiopia did enough for team silver, while Japan took team bronze. Alyson Dixon was the quickest of the two Brits in action, her impressive 70:38 for 18th a lifetime best which moves her from 18th to 11th on the UK all-time list. Scottish marathoner Susan Partridge had been looking to go quicker than the 73:55 she ran for 22nd at this event in Bulgaria in 2012 and although she beat that time, running 73:16, it was only enough for 40th. She finished one place behind Jessica Draskau-Petersson who was representing the host nation but has lived in Britain for long spells.